Oh look, there's already a wearable that'll make you look more obnoxious than a gold Apple Watch ever could. 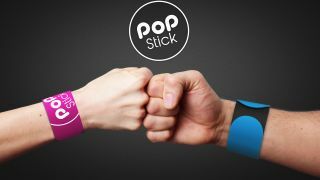 It's a 90s slap bracelet that rolls into a selfie stick - way to soil our childhood memories, Pop - launching on Kickstarter this month for anyone who fancies paying for the privilege of being the worst person in the world. Did you spot Apple's Jony Ive in the Star Wars trailer?